MANAGING a 280-head dairy these days is challenging enough. But doing so in a minimum security prison carries a whole other set of parameters. 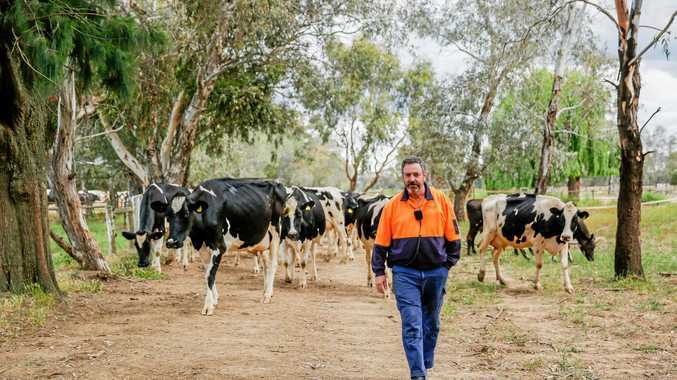 Since Dhurringile Prison first established its dairy in 1995 - on 170ha near Murchison in the Goulburn Valley - Adrian Cook has been the farm manager. About 200 litres of milk per day supplied to the facility's 330 prisoners (pasteurised on-site) - and the remainder sent to Tatura Milk (about 6500 litres daily). And, he added, labour has never been a problem, with up to 20 prisoners working in the 24-unit conventional walk-through dairy, as well as about 40 inmates working on the farm. Being a State Government-run facility, he has a dedicated annual budget, which sees the farm upgraded, including planned 130ha of pipe and rise irrigation. This will complete the entire property's irrigation network, which has a 660 megalitre entitlement. The farm also has about 120ha of pastures renovated or over-sown annually. Yet Adrian has challenges no other dairy farmer faces. Prisoners need to be perpetually trained, with new inmates with no or little experience working in the dairy for three months up to two years, while skill levels "vary considerably”, as do motivation levels. "We try and run as much like any other dairy as possible,” Adrian said. ADRIAN has worked at the dairy since its outset. He sourced the Holstein foundation stock from Rockwood Park dairy and now buys Cloverton British Friesian bloodlines from Finley NSW and Coomboona Holsteins in northern Victoria. For the past two decades, the dairy has used the World Wide Sires mating system, aiming for varying traits from teet placement and length to feet and leg conformation: "we're continually improving, with different issues at different times”. The herd is mainly Holstein with a few Jersey-cross, with Jersey bulls used over heifers. A split herd sees joining on November 1 and then June 1, with artificial insemination followed by a mop-up bull. Early on, Adrian gained his AI ticket and does the AI work himself. Adrian also worked hard to learn on the job veterinary skills, and is now able to treat herd feet problems and some health issues, while he also teaches prisoners these skills. Training for prisoners runs throughout the year, all so they can find work in the industry when they leave prison. Courses are run by Box Hill Tafe and include basic dairy certificates, and farm skills such as tractor and chainsaw operation and fencing. "Courses are open to any prisoners,” said Adrian, with Dhurringile focused on wood and metal work skills for most inmates. DAIRY prisoners work on a six-day roster, while farm prisoners work a five-day roster. About five milkers work from 5.30-8.30am and then 3.15-6pm, followed by other dairy jobs such as calf rearing and feeding. On-farm prisoners work on pastures, irrigation, weeding, fencing and tractor work. Flood-irrigated pastures are a mix of perennial and annuals, including lucerne, and subclover, with shaftal and rye-grass cut for fodder. Supplementary maize silage and cereal hay are purchased. Stock numbers peaked in 2001 at 380 cows and during the drought dropped to 170. The herd is milked twice a day, with the average cow producing 7500 litres per lactation. Average butterfat is 4.07 per cent, protein is 3.42 per cent and cell count is 180,000-200,000 cells/ml. Dhurringile was originally a 68-room homestead for a farm and was built in 1877. The prison dairy initially used one of the original outbuildings for a four unit walk-through dairy, which was quickly upgraded to eight units and then a new 24 unit walk-through dairy built in 1997. Earlier this year they built a 96mx25m shed, with one section used for calving down cows, with a future potential to use cameras for observation of night-time calving. Adrian said given it is a state-run facility, it aims for best practice, on a budget.